- These reflectors can fit any standard reflector holders. - The translucent reflector acts as a diffuser between the light source and the subject, which can soften light. - The silver reflector is used to enhance the light in low light situations. - The gold reflector is perfect for creating warm outdoor sunset scenes. - The white reflector develops a soft, clean light and it also helps to decompress the flash. - The black reflector makes a shadow and is perfect for creating a certain dark and mysterious mood. - Durable and flexible steel spring frame insures easy spreading and closing. - Carrying case is made of black heavy duty material with a sturdy zipper, which is durable and portable and suitable for outdoor photography activities. 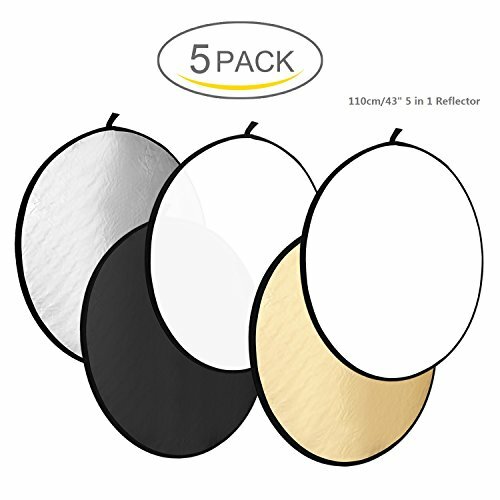 5 in 1: Gold, Silver, White, Black and Translucent. The reflector with five different reflective surfaces can be used to fill in, reflect, diffuse, absorb or soften light. If you have any questions about this product by WAAO, contact us by completing and submitting the form below. If you are looking for a specif part number, please include it with your message. Impact Collapsible Circular Reflector Disc - Soft Gold/White - 12"